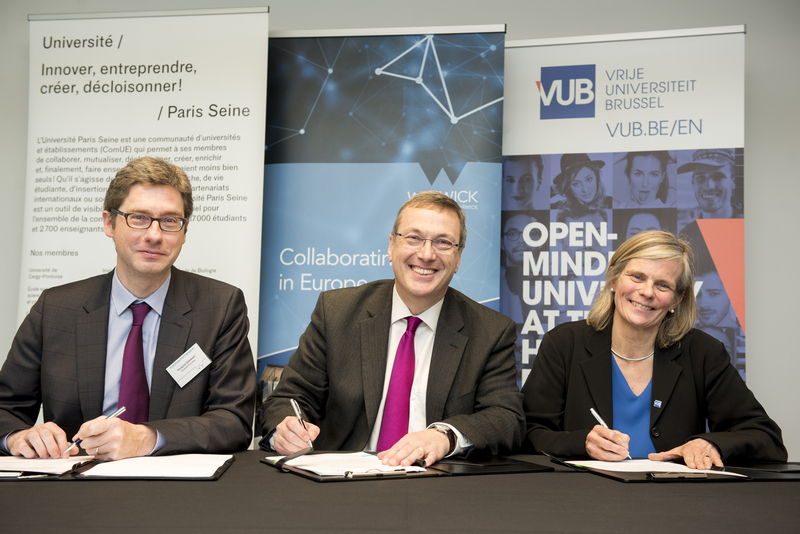 The University of Warwick has today signed and launched two major teaching and research collaborations with partner universities and colleges in Paris and Brussels. The initiative, launched today in the University of Warwick’s base in London’s Shard building, commits Warwick to a close and active research and teaching alliance with French and Belgian partners despite the political and economic cleavages that Brexit could bring to future UK relations with continental Europe. “Europe-wide research and teaching collaboration has helped transform the lives not just of our students and researchers, it has underpinned jobs, and spurred innovation and advances in health, manufacturing, culture and so much more. Politicians in and out of office in every country in Europe are still deliberating how the UK can still be part of that in future but we can’t afford simply to wait for that to be fully resolved. We chose to act now not just to show our commitment to work together in future but to begin work on a range of activities that delivers on such a commitment. 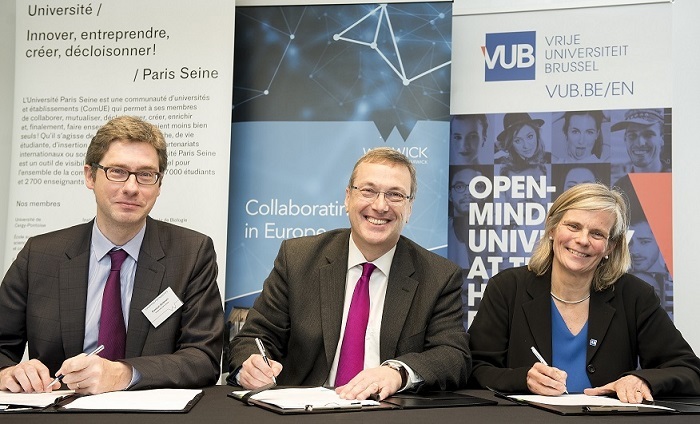 "These institutional collaborations with Paris Seine and the Vrije Universiteit Brussel also initiate for Warwick a long-term strategy of extensive and ambitious European engagement. We shall seek to strike complementary and innovative partnerships with our European counterparts that will collectively form a dynamic network centred on truly collaborative research, teaching, and enterprise activities. One especially exciting feature of this is the opportunity to develop multilateral arrangements that involve several nations, systems and disciplines. Warwick is a highly internationalist university, with an established presence in key European cities. At a time of significant national and international changes affecting our sector, we naturally wish to be in the vanguard of educational innovation in Europe." The initiative is launching today at the University of Warwick’s base in London’s Shard building with the signing of agreements to commence work immediately on a detailed work programme of research and teaching partnerships that will be established in the next 48 months. Establish a collaborative Mathematics appointment — L’Université Paris-Seine will appoint a lecturer in Mathematics by the Autumn of 2018. The post holder will spend up to 3 months a year at Warwick to interact with researchers in Warwick. Create a series of student exchanges including a possible exchange between ESSEC (part of L’Université Paris Seine) and Warwick Business School for students on Masters in Finance programmes. Mount two large academic conferences with L’Université Paris Seine (on Global Complexity in 2018 and Arts and Heritage in 2019). Explore opportunities for a range of further research or teaching collaborations (or both) in a range of disciplines including: Business, cultural and media policy, applied linguistics, mathematics, statistics, computer science, education, and range of other arts and humanities areas. The agreements to form these partnerships with Warwick were signed today by Warwick’s Vice-Chancellor Professor Stuart Croft , Professor François Germinet, Président of Université Paris Seine and Professor Caroline Pauwels, Rector of Vrije Universiteit Brussel. “It is important today for our institutions to work together to produce cutting-edge knowledge and to train influential and responsible leaders who are attentive to new trends. With the call for expression of interest and this partnership, we will construct a strong alliance with European Universities and Business Schools in order to be a major player on the international higher education stage and propose our students truly innovative and disruptive learning experiences." The University of Paris Seine ComUE is a network of excellence. Bringing together 15 higher education institutions, this group enables its members to collaborate, to gather, to create and to decompartmentalise. In other words, to do together what they would not be able to do by themselves. The ComUE represents essential leverage and visibility for its community in terms of academic training, research, student life, professional integration and international and socio-economic partnerships. Its community is composed of 37,000 students, 2,700 teacher-researchers and 2,000 administrative staff members. an interview with Professor Sean Hand on Warwick in Europe here.